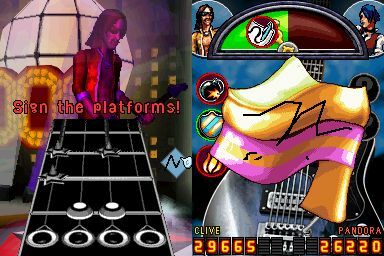 It’s good to see another Guitar Hero game on the Nintendo DS with it’s best incarnation ever… Guitar Hero on Tour: Decades that once again allows gamers to unleash their inner rock god through the classics which span the 1970's to the music of today. Best of all, the music library features a vast and different track list, ensuring that there is a song for everyone and needless to say, I was quite impressed at the following songs includes in Guitar Hero on Tour: Decades. The Darkness - "Thing Called Love"
Fall Out Boy - "Take Over, Breaks Over"
Although the Guitar hero franchise has been around for quite some time on the PS2, Wii, PS3 and XBox 360, the portable console world has been unfortunately lacking. 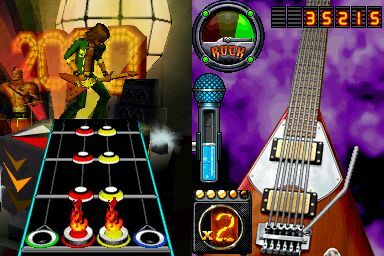 Even though you had almost real-size guitars on the bigger consoles, Activision have cleverly translated this franchise to the portable world of gaming thanks to the innovative touch screen system that has translated the original game almost perfectly on Guitar Hero on Tour: Decades feels as you attempt to match colours. Of course there is a grip included for the Nintendo DS which allows for better control and hopefully prevent any Wii-like accidents. 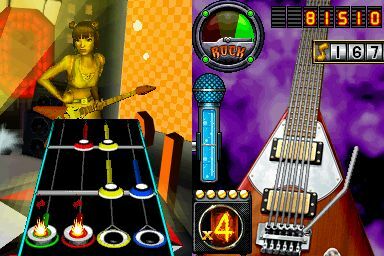 With 28 different songs, gamers have a variety of different gameplay modes, whether that includes solo, co-operation and even a versus mode on the Nintendo DS. Of course, most people will attempt the career mode that as you progress, the songs get more and more difficult, however is of course dependent on your difficulty level. As you progress, you unlock more tracks and venues and of course make more money which can be used to purchase new guitars and clothes for your wannabe rockers. Graphically, the title is rather impressive on the Nintendo DS with some great special effects for this console and some decent animation. Of course, the star of the game is the music itself which sounds phenomenal on the DS, although you really need to listen to this with headphones to truly experience this game. With Queen and Lenny Kravitz, I’m truly in Guitar Hero heaven! 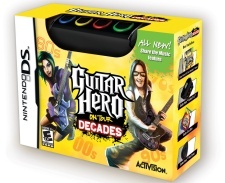 In conclusion, Guitar Hero: On Tour Decades features some great new songs to this already great franchise that translated extremely well onto the Nintendo DS. If you loved the original, than you definitely need to purchase this addition, however if you have never played Guitar Hero before than I highly recommend you check this out and purchase the game and bundled controller. Highly Recommended and hours upon hours of enjoyment!